Evil spirits. Demons. Ghosts. Magic. Satan. Do these words speak of a frightening spiritual reality? Or are they the silly remnants of a more superstitious age? The modern world seems to lurch between these two attitudes. At one level, we have never been more sceptical about ghosts and demons and Satan. And yet there are many, even in Western societies, who are deeply fearful of evil spiritual forces. There are yet more still who find the topic fascinating and endlessly devour movies and TV shows that exploit these ideas and themes. Christians also often swing between paying the devil far too much attention, and not enough. Some Christian groups become obsessed with notions of ‘spiritual warfare’ and ridding people of demons, whilst other Christians regard such talk—even though it is found in the Bible—as outdated and part of the superstitious misunderstanding of the world from less enlightened, less scientific times. In Living with the Underworld, the head of New Testament Studies at Moore Theological College, Peter Bolt, takes readers on a breathtaking journey through the spiritual underworld revealed in the pages of Scripture, and shows how Jesus came to reveal its true nature, neutralize its power, and liberate us to live without fear. Living with the Underworld does not dismiss the Scriptural evidence of the spiritual underworld, but nor does it go beyond what we can know about that realm. Peter Bolt explores what God reveals to us in the Bible, and very helpfully points us to the power and significance of the cross. In so doing, he reveals a little-understood framework for understanding the life, death and resurrection of Jesus—a framework that will enlarge and enlighten evangelical thinking. 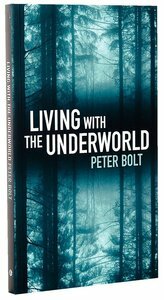 In Living with the Underworld, Peter Bolt brings his quirky and humorous style to his topic, and makes his book hard to put down because it is so fascinating and engaging. About "Living With the Underworld"
Dr Peter Bolt (Ph.D., King's College, University of London) is Head of the Department of New Testament at Moore Theological College, Sydney. He is the author of Jesus' Defeat of Death: Persuading Mark's Readers(Cambridge, 2003); The Cross from a Distance: Atonement in Mark's Gospel( New Studies in Biblical Theology 18 IVP, 2004); Living With The Underworld (Matthias Media, 2008); Matthew (Reading the Bible Today, Aquila Press) and See How We Died: A Biblical Theology of Mortality (NSBT InterVarsity). He is also the editor of, and contributor to the 2008 Moore College School of Theology published in Christ's Victory over Evil: Biblical theology and pastoral ministry. Customer Reviews For "Living With the Underworld"
This short book on the reality of the demonic from a biblical perspective is refreshingly Christ-centred. Bolt affirms the reality of the demonic, but strives to be faithful to the Bible. He directs our focus away from the demonic itself, but towards Jesus who has conquered Satan and death. He goes where the Bible goes and strips the believer of the need for fear. To me, Bolt writes about the world of the devil and his minions from a comfortable armchair, from head knowledge and not from the experience of the battlefield. It's like writing a travel book on far off places you've only read about in books. It lacks substance and passion and fails to address and even denies the real need out there in the world. I give it 1 star but the devil would probably give it 5. Sorry Peter.